Younique Divine Daily Moisturizer is a high end supreme moisturizer that has been formulated for all skin types – we call that Divine! Younique Divine Daily Moisturizer was made to suit all skin types, it delivers the hydration your face is craving. This moisturizer is fantastic for even those with sensitive skin. 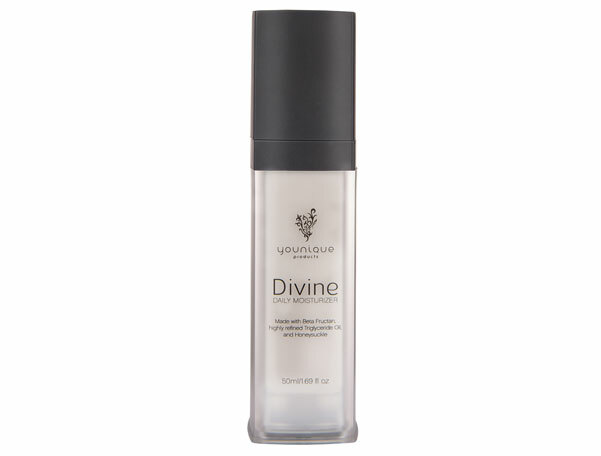 Just one pump of Divine Daily Moisturizer is all it takes to cover your entire face. You will love the silky smooth, non greasy feel and how soft your skin will be with this moisturizer. Even those with oily skin will love this non-greasy formula. Use it in place of your day cream and before you apply your Younique Glorious Primer and makeup. My Review of Younique Divine Daily Moisturizer : I have always had dry skin and have sadly never been the best about skincare. I got this new moisturizer the minute it came out because I knew I needed to start taking better care of my skin. I’m in my mid 30’s and the damage is starting to show 🙁 I was amazed when I first tried this because I only had to use a very small amount for my whole face. It also didn’t add extra shine, it wasn’t greasy and my skin felt baby soft. The true test was waiting to see if I broke out because I often do with new products but this moisturizer does not irritate my skin at all and did not cause any breakouts. It’s made with only the best naturally based ingredients with no added preservatives or unnecessary chemicals. I’m a believer now and will not go without Younique Divine Daily Moisturizer.